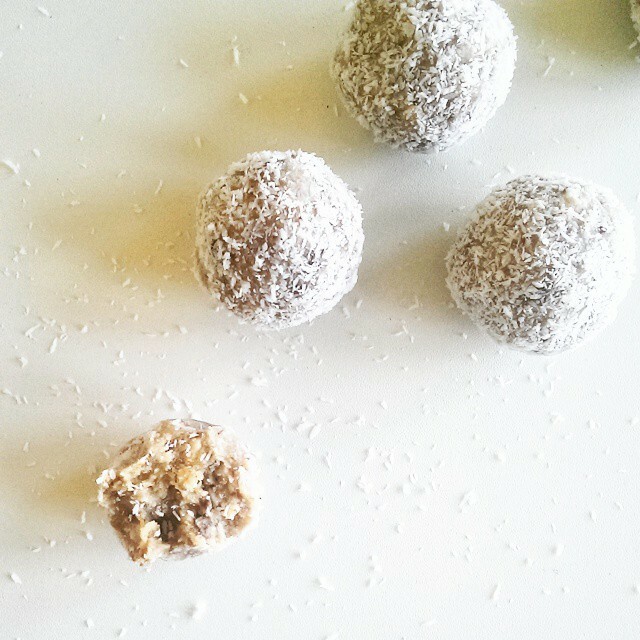 I strongly believe nothing beats chocolate when it comes to treats, however these bliss balls cure my sweet tooth and are packed full of goodness! These are paleo and very easy to make. 1. In a food processor, process the dates until a paste forms. The dates need to be fresh or softened to be able to achieve this. To softened dates, place them in a microwave for 20 seconds or pour boiling water over them and sit for a few minutes before draining the water out. 2. Add the almond meal, desiccated coconut, coconut oil, maple syrup or honey, salt, vanilla and lemon. Process until well combined. 3. Add the whole dates and process for a few seconds at a time until the nuts are roughly chopped up. You want the bliss balls to have a bit of crunch. Next, place the mixture in the fridge for 10-15 minutes. 4. Remove from the fridge and set up a bowl with water, a bowl with coconut and an empty bowl to put them in. 5. I normally weigh the balls so they are equal size for the cafe, but you can free roll them into the size of a walnut or golf bowl. First I lightly wet my hands and roll the dough into a ball. Roll it in coconut and place off to the side. Repeat with the rest of the mixture and store in the fridge.